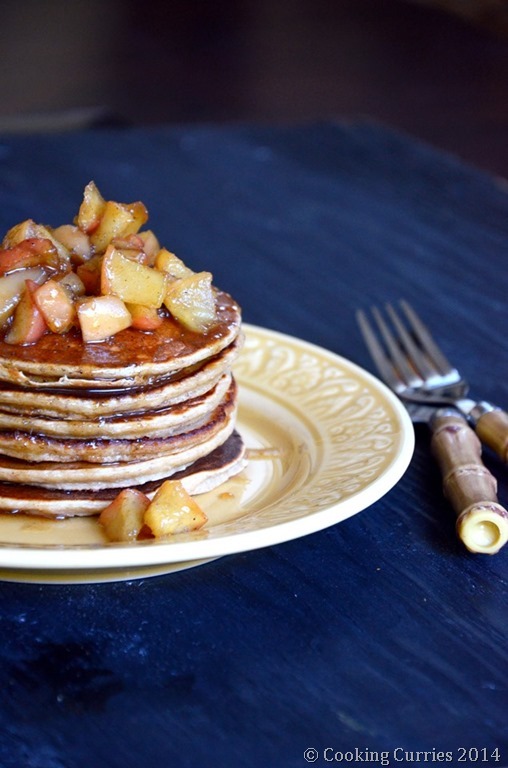 Warm cardamom spiced honey apple compote poured over a stack of these Apple Cinnamon Pancakes, will take you to the coziest of all places! This is just gonna be one of those blog posts with not much writing from my end. I make pancakes for V’s breakfast, at least a couple of times a week and once I had some applesauce that was about to near its expiry date and wanted to finish it. So, I added that and some cinnamon to the regular pancake batter and made this apple cinnamon pancakes for V.
I still had some left over batter, so while I was making the rest of the pancakes, I quickly whipped up some apple compote, spiced it up with some cardamom and had that as my brunch. And a very filling brunch that was! Mix all the ingredients for the pancake batter very well, so that there are no lumps. Heat a skillet, add a dab of the butter (from the 2 tbsp butter) and pour a ladle full of pancake batter. Keep the heat on medium. Once small bubbles start appearing on top of the pancakes, flip them over and cook on the other side for a minute or so. Heat the butter in a sauce pan. Add the brown sugar and let it melt. Now add the apples, honey and cardamom. Cook on low heat till the apples are soft. Add the optional water, if it seems to get dry. These look so good! 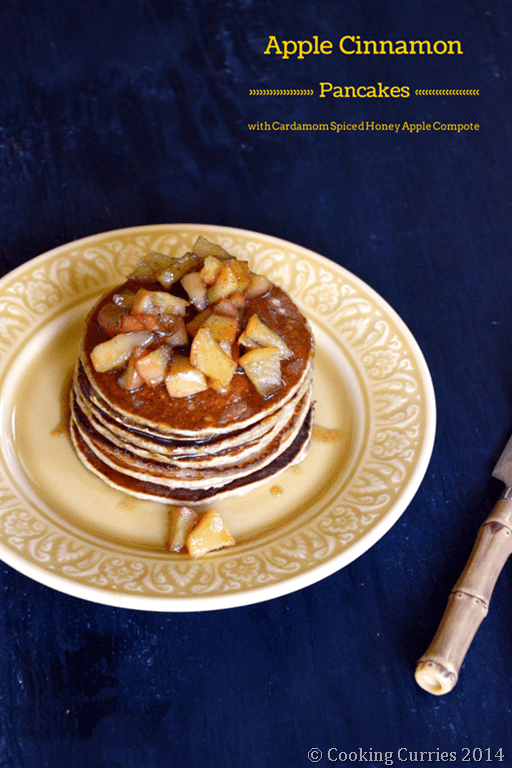 I love pancakes and I’m always looking for new varieties to try. I like cardamom with apples. I recently baked apples with cinnamon and cardamom and they turned out really good. I’m sure I’ll enjoy this recipe too. I haven’t had pancakes in a while..last time my pumpkin pancake failed so I will have to redo it. These are awesome pictures and the easiest recipe so far… I am NOT a chef but will definitely try to replicate your recipe. Cardamom is one of my favorite spices. I can’t wait to try these. Woah! Those pancakes look OH SO YUMMY. I have NEVER been able to make pancakes without burning them but I’ve been wanting to try again so I’ll have to give this recipe a whirl and open all the windows just in case so I don’t cause the fire alarm to go off (again :)). Looks amazingly delicious and I cannot wait to make this! Beautiful pictures! 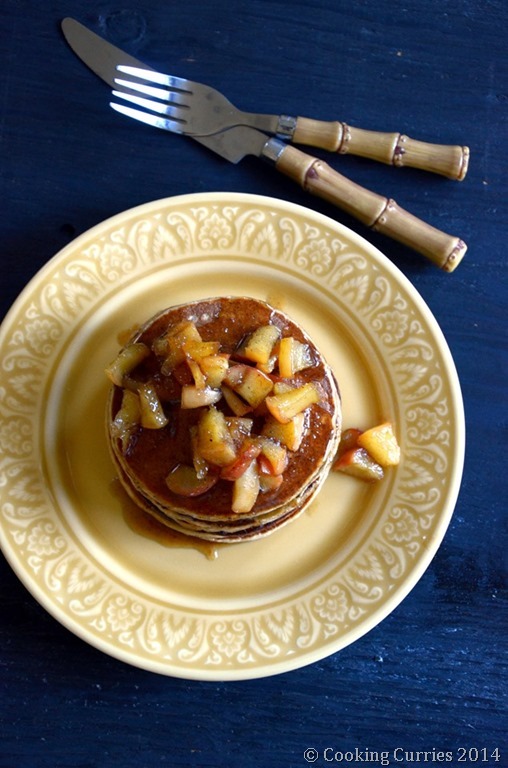 These look like a warm, tasty comfort food for a cozy fall morning! Yummy!! This will make a real nice breakfast for my kids and me. Thanks so much for sharing it! The flavor combination looks spectacular! Can’t wait to give them a try.